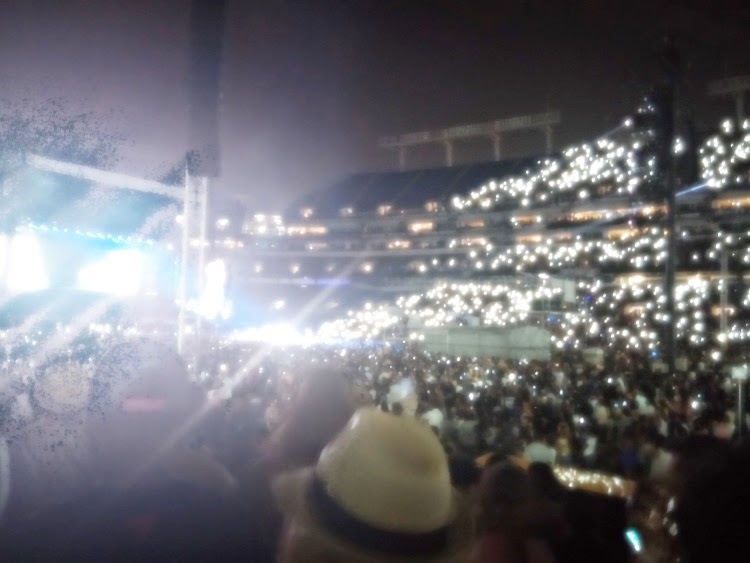 Can you believe that I did not upload one picture or video from the On the Run tour last Monday at M&T Stadium in Baltimore, MD? Yeah, me neither! The above picture is one shot that I snapped really quickly. This is the Lower Sideline, just one level up from the floor. The crowd was huge. Once I got out of my funk, I remembered exactly why I love these two performers – they both put on a great show! 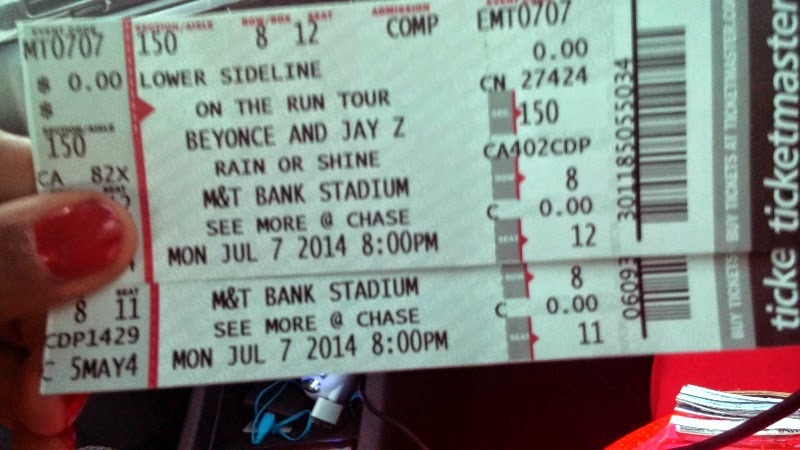 I have seen both Beyoncé and Jay Z in concert, separately, before this tour. But nothing beats seeing the couple taking the stage together. It was electrical and nothing short of awesome. I still can't believe I won each time that I listen to this audio. I am so blessed! What to wear to this type of event? The possibilities are endless. 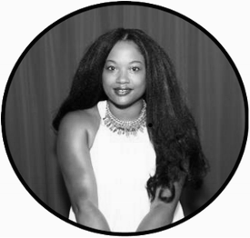 The truth is, no one is really there to see you, especially if Beyoncé is in the house. Unless you are trying to "catch" something that night, you really should keep it simple without compromising your style. 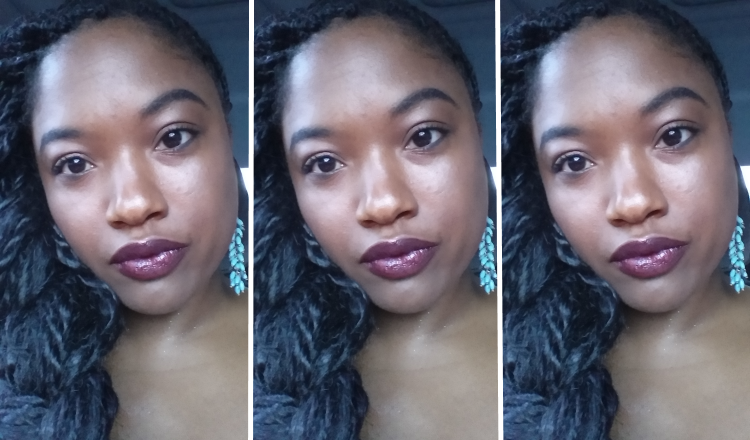 I chose a simple cotton dress from Forever 21 that I recently purchased from thredUP for $3 (here's an invite for that, too: http://www.thredup.com/r/OD77L4). It was perfect. I wore my platform leopard heels for a little fun. They did not hurt at all from walking in them. The problem came from having to walk quickly and in the grass. I would highly suggest wearing flats to stadium tours. I even saw some girls carrying a set of flats in their hands. If you like dancing, don't wear anything too restricting. Also, keep in mind that it will be hot. The crowd is huge. There was a nice breeze sweeping through the stadium, but not enough to keep the sweat away. Now, back to the concert. Here are a few blurry pictures of Beyoncé. I told you that I was completely into the concert. It was not my typical behavior. I normally snap a pic of everything. I think I only managed to get these shots because I loved this outfit. I was a leather jacket with cut-off jean shorts. 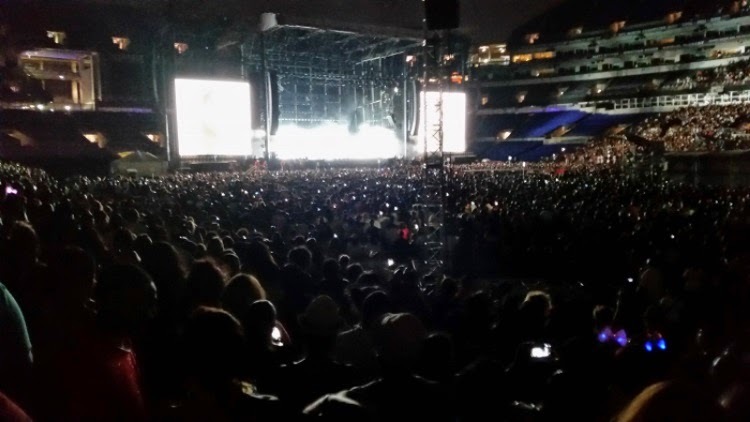 For these types of events and power artists such as Jay and Bey, the crowds are huge. You should allow at least, at LEAST, two hours to get to your venue. I would leave three hours before. Unfortunately, we got a late start because Mr. Hardworker could not leave work until late. Most of the traffic was in the immediate area, around the stadium. If you know back routes to the location, I would suggests using them. Also, carpool. That cuts down on the amount of cars heading to the stadium. You can utilize public transportation, too. I hear that can be a bit hectic as well. Some of my friends used services like Uber (here's an invite: https://www.uber.com/invite/uberKeonte) to get them to their destination. No need to worry about parking this way. Whatever you do, plan ahead. The show was scheduled to start at 8:00 PM. I don't know if they pushed it back to a 9:00 PM start time because of the traffic situation, but I am sure grateful they did. We missed a few of the opening songs. 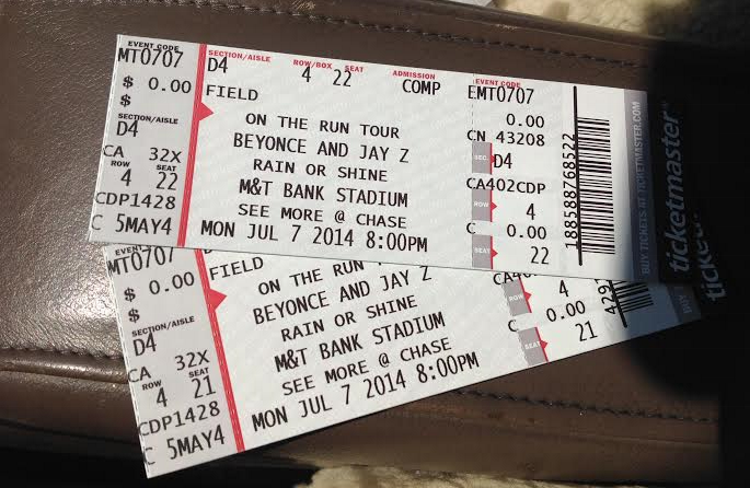 As we were walking fast to the stadium, we could hear Bey and Jay performing. The music was flooding the streets of downtown Baltimore. If you wanted to get a chair and sit nearby, you could have listened to a cool concert, minus the visuals. The concert went on for well over two hours; closer to three hours. Most of the concert-goers were on their feet the entire show. There were a few selections that were intimate and gave us the opportunity to sit down and relax (see below). But, not for long. I was surprised to have seen so many people that I recognized. I guess I should not have been considering the arena holds 30,000+ people. I was bound to see someone I knew. The let out wasn't bad. It was a lot of slow walking in large crowds, but once you hit the outdoors, it was smooth sailing. We did sit on the parking lot for awhile just waiting for traffic to let up. I don't think it was directed that greatly. We managed to take some back roads on the way home that got us away from all of the city traffic. That was a plus. Overall, the night was memorable. It started off a bit rocky, but smoothed itself out thanks to the greatness of Beyoncé and Jay Z. I am forever grateful for the tickets that I won from the radio station (and my determination). If you want to catch the On the Run Tour, there are still a few dates left in the United States. Find them here. The announcement of HBO's decision to air the concert in September is the icing on the cake. I will be front and center, on the couch watching...as if I was right there at the stadium again. You must add: 'See Beyonce and/or Jay Z in concert' to your bucket list. It's so worth it.